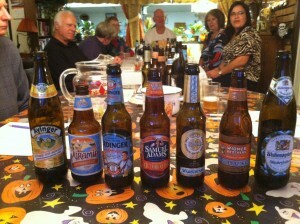 October Taste To Learn event was Oktoberfest beers hosted by Phil & Karen Eversole on Sunday, October 14th. There was a $5 fee for this event to cover costs of the beers which was very well worth the price. Where else could you sit down and taste 7 beers and get an education at the same time? Besides opening their home to us, Phil and Karen provided brats & hot German potato salad for the main meal. Attendees brought a variety of German style foods, beers and wines to share at the potluck meal. There were about 12 attendees who received an exceptional amount of interesting information about Oktober-Fest history and types of beers brewed for the season. We tasted 7 beers and used a scoring sheet that had 5 points each for Appearance, Aroma, Flavor, Mouth Feel, and Drinkability. The following are the scores and costs of each brew. 1 point = OMG you PAID for this???? A great time had by all! Thanks Phil and Karen! !